Ronald D. Witherup, SS, is Superior General of the Sulpicians, an order of diocesan priests dedicated to initial and ongoing formation of priests. He holds a doctorate in biblical studies and is the author of numerous books and articles on scripture, including, Gold Tested in Fire A New Pentecost for the Catholic Priesthood, and Biblical Fundamentalism, What Every Catholic Should Know, both published by Liturgical Press. 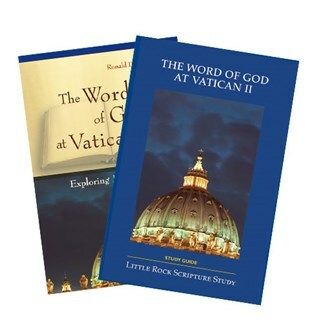 He is also the New Testament editor of the Little Rock Catholic Study Bible. This simplified 4 week study requires no video or audio lectures. There is no introductory session, either, so participants should be encouraged to obtain their study sets ahead of time and come prepared to discuss Lesson One at their first gathering. The Study Set, however, is similar to study sets found in almost any other Little Rock Scripture Study. It consists of a commentary, The Word of God at Vatican II: Exploring Dei Verbum, written by Ronald D. Witherup, SS (Liturgical Press, 2014) and a Study Guide. The commentary includes a translation of the document Dei Verbum, also known as The Dogmatic Constitution on Divine Revelation, along with background information and insightful commentary. The Study Guide is written by Catherine Upchurch, with 18 questions for each of the 4 lessons.